Where to look for deadly yellow jackets, hornets, wasp nests, even in the ground where dogs and children roll and play. How to check property for any sign of nests! The family was getting ready for a weekend outing. The puppy was romping about, getting in the way, and like the children, excited about going. Suddenly he was sick. Within a few minutes, he was staggering, frothing, eyes glazed. They jumped into the half-packed car and sped to the emergency clinic. Too late. The puppy died within minutes of their arrival. As the family struggled to cope with the shock, the puzzled vet asked if he could perform an autopsy. The father, holding his little girl, nodded affirmatively. In addition to a couple of stings on the puppy’s face, three wasps were found in his stomach. They did not go willingly for there were also lesions evident on the tongue and in the back of the throat. The vet explained that anaphylactic shock occurred as a result of the stings, possibly before the puppy swallowed them. He may have bitten at the wasps as they stung him or he may have just thought it great fun to catch the things. They will never know how he came to ingest the wasps but the stings brought on anaphylactic shock which led to heart failure. The puppy died as surely as if he had been shot or run over. The mother remembered treating her son for a wasp sting. When they checked later, they found a huge wasp nest high up under the eaves. They shuddered to think what could have happened to their son. Had the family not been right there with the dog, he would have just been found dead and chances are, they would never have known about the wasps. They looked at each other, realizing the puppy's death could have saved their son. If your property is fenced for the dogs (it should be) walk every square foot to check for wasp nests in the ground. The nest may be covered by grass so watch carefully for any activity in the grass, especially where grass might be higher around yard ornaments, bird baths, etc. Don't depend on finding the wasp's nest when mowing! Fortunately, you are unlikely to spot it that way, and be glad of that. Wasps (and hornets) are more intelligent than you might think and they become accustomed to the mower. Carry a long stick with which to probe any suspect area and be very alert for any wasps you disturb in or around that nest. Now look up and walk around your property again. Also look in trees adjoining your property. The tree nests are usually easy to spot but may be hidden in the branches. Some wasps seem to camouflage their nests by building them around leafy branches which grow right through the papery-looking mass. Then there's Yellow Jackets, which are probably the most aggressive stingers of the wasp family. 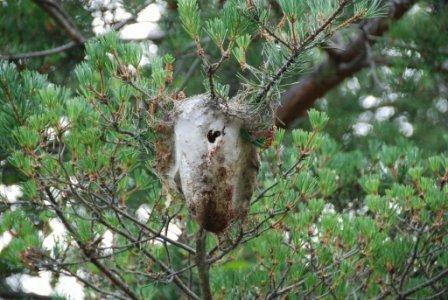 They build "papery-looking" nests in trees, enclosed spaces or holes in the ground. Hornets are common in the U.S. and they also build nests inside tree trunks or niches in the walls of your house. They may even invade your attic! "Domestic wasps" are a home owners nightmare wasp and if they are inside your home, call professional exterminators. Check the eaves all the way around your house for what's commonly called "mud dauber" wasps. 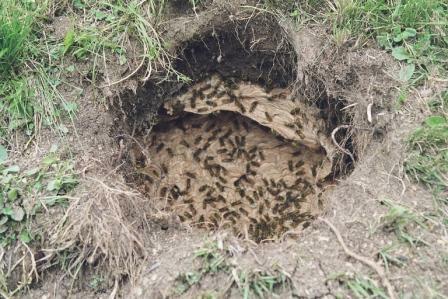 These nests are usually smaller and its not unusual to find them over an entry door although the wasps don't seem interested in coming inside. But if you see signs of wasps (or even bees which are not as aggressive or dangerous as wasps) buzzing around the roof overhang, you need to CAREFULLY check your attic. Common sense: If you are allergic to bee or wasp stings, or think you might be, it is best to call the exterminators. Just pinpoint the location of the wasp nest and call the pros. It is not worth the risk of "stirring up a hornet's nest" and getting you, your dogs, or your neighbors stung. For outside nests, you can buy special wasp spray in cans that shoot a long thin stream of wasp killer at the nest. By the way, wasp spray is easy to aim and very effective should a stranger try to barge through your doorway. Aim for the face! You might want to keep a can by every entry door, it is safer (for you) than a firearm. Check your home this summer. If you have outside kennels, be especially watchful. Safely destroy and dispose of all nests, even the “dirt-dobber” variety so that your dog does not fall victim to a preventable accident.